A jaw-dropping innings of 84* from 43 balls by rookie Ashton Turner propelled Australia to an unlikely win in the fourth ODI in India last night, levelling the series at 2-2. When Turner arrived at the crease Australia looked gone, needing 130 from 77 balls against the world’s best ODI bowling attack on their home turf. Yet Turner played an innings of composed brutality, hammering five fours and six sixes. He intimidated the Indian spinners with his reach and clean striking. This much was clear when, from his 15th ball faced, Turner picked a Kuldeep googly from the hand and clobbered it for a low six straight down the ground. Later in his innings he got stuck into India’s quicks, clattering boundaries off both Jasprit Bumrah and Bhuvneshwar Kumar. Meanwhile, the hot form of Usman Khawaja and Peter Handscomb is beginning to put pressure on struggling Australian skipper Aaron Finch, who was bowled for a duck last night. Finch showed signs he had perhaps turned a corner in the third ODI by scoring 93 only to be dismissed in all-too-familiar fashion last night, bowled by a pace delivery coming back in at him. That latest duck gives the 32-year-old an average of just 15 from his last 20 limited overs innings for Australia. David Warner, easily Australia’s best ODI batsman, is expected to return at the top of the order for the World Cup. 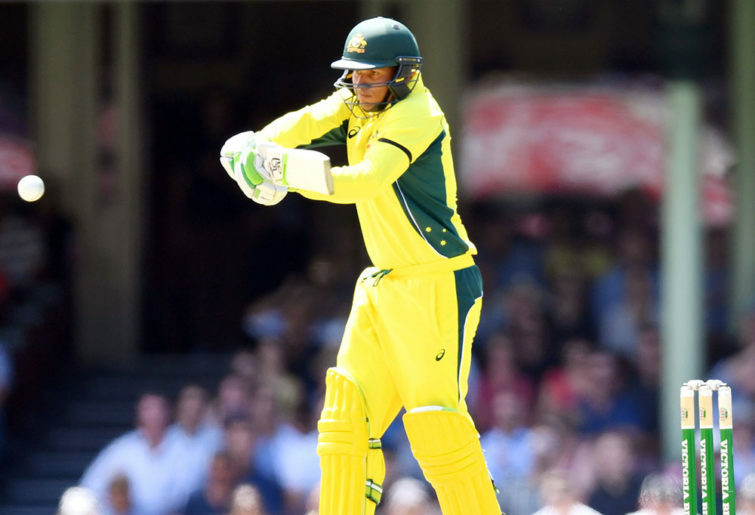 That means the second opening berth may well be between Finch and Khawaja, who stroked 91 last night and has made 397 runs at 57 since returning to the ODI side this year. Khawaja’s numbers are extra impressive when you consider that all seven of those matches have been against India, who have comfortably the world’s best ODI bowling attack. There is a chance Khawaja could perhaps bat at three in the World Cup. But there’s also a logjam of other players trying to slot into the top six including the returning Steve Smith, the in-form pair of Peter Handscomb and Shaun Marsh, valuable all-rounders Glenn Maxwell and Marcus Stoinis, and newcomer Turner. That makes nine players jostling for positions in Australia’s top six for the World Cup – six of whom are in better form than Finch, plus the star pair of Warner and Smith. No one has made a stronger impression in this current series in India than Khawaja. The 32-year-old previously has had only one lengthy run in the ODI team, back in 2016. While he didn’t make the most of that chance Khawaja is exploiting his current opportunity. So, too, is Handscomb, who made a wonderful 117 from 105 balls last night. Since he came back into the ODI side in January Handscomb has underlined just how much he has improved as a 50-over batsman. In that time, across seven matches against India, Handscomb has made 335 runs at 48, with a terrific strike rate of 98. His innings last night was one of the best seen by an Australian in an ODI in recent memory. It was calm and well-paced, with his play of spin especially good. Earlier, Australia were taken to the cleaners by the powerful Indian batting lineup on a road of a pitch. India at one stage were a strong chance of making 400 before a flurry of wickets slowed them up and saw them finish with what was still a monumental score. India’s huge total was built on the back of a 193-run opening stand between Shikhar Dhawan (143) and Rohit Sharma (95). With the World Cup looming India will have been delighted by the return to form of that pair, who have been below their best in ODIs this year. Dhawan struck the ball particularly crisply, offering the Australian bowlers the finest of margins for error. After that monstrous opening stand Australia did well to not capitulate and to manage to take nine wickets in the final 19 overs. Quick Pat Cummins (5-70 from 10 overs) and leg spinner Adam Zampa (1-57 from 10 overs) were the pick of the bowlers for Australia, while Jason Behrendorff (0-61 from 10 overs) bowled better than his figures suggest. This was the sort of commanding batting performance that had been a while coming from India, who had not passed 300 once in their previous six ODIs against Australia in 2019. It looked like a score which would be well out of Australia’s range, particularly after they lost two early wickets. But the fighting efforts of Khawaja, Handscomb and Turner underscored the fact that Australia’s ODI form is quickly turning around.